Ugandan singer and politician Bobi Wine, arrested and tortured by the regime of President Yoweri Museveni in August, is now in Washington, DC receiving medical treatment. While still recovering, he is also continuing to speak out and planning to return to Uganda despite continuing threats to his life. His eloquent voice is echoing not only in Uganda and elsewhere in East Africa, but also around the continent and beyond. And his message is simple and powerful: it is time for freedom, and aging autocrats cannot forever hold back change. Notably, while the Al Jazeera interviewer (in the Sept. 11 video below) repeatedly poses questions on Bobi Wine's individual future, Wine's answers focus on the Ugandan people and particularly the youth. This AfricaFocus Bulletin contains a background commentary by Ugandan journalist and human rights blogger Rosebell Kagumire, a recent interview with Bobi Wine by OkayAfrica, and excerpts from recent AfroBarometer polling results documenting the gap between Ugandan's desires for democracy and their experience of rule under Museveni, who has held power since 1986 and recently forced through a constitutional change to permit an additional term in office after the next election in 2021. If you don't have time to read all the articles and additional links, however, and have access to video on youtube, do at least take a look at a few of the videos listed below and at links within the articles, whether you prefer to hear the message in interviews or in music. Bobi Wine and the beginning of the end of Museveni's power: Can an artist-turned-politician deliver the final blow that brings down Museveni's rule in Uganda? The lawyer of the 36-year-old singer said he had been "brutalised" in detention. Kyagulanyi initially was charged with illegal possession of firearms and ammunition in a military court while the other three MPs were detained and charged with treason on August 16 along with 31 other Ugandans. After ten days in military confinement, the military court dropped Kyagulanyi's charges but he was re-arrested and also charged with treason. The detainees have been accused of pelting a presidential motorcade with stones on August 13 in the town of Arua; at the time of the alleged incident, President Yoweri Museveni was not in any of the cars and had long left the town. That day, political rallies were held by the ruling party and the opposition ahead of important byelections. Two days later, independent candidate Kassiano Wadri, whom Kyagulanyi supported and who was also detained, won the vote in Arua. This was the third parliamentary byelection Museveni's party lost to the opposition and Kyagulanyi, or Bobi Wine, played a key role in the outcome of the vote. The presence on the political scene of the 36-year-old musician-turnedparliamentarian, who took up politics after 15 years in the music industry, is seen as a growing threat by the ruling elite. These fears and the violent reactions they are generating might turn into a self-fulfilling prophecy. Kyagulanyi was born in Mpigi district, central Uganda, but came of age in Kamwookya, one of the poorest suburbs of Kampala. It is here that he launched his music career in the early 2000s after he graduated from Uganda's oldest university - Makerere University - with a degree in music, dance and drama. He came to be famously known as the "Ghetto President" for persistently speaking out about the struggles of the lower classes and the urban poor in Uganda. His outspokenness and growing popularity made him a target of government censorship, particularly after President Museveni, who has been in power since 1986, started feeling the demographic shift in the country's electorate. For a decade he had relied on the rural vote and older people who still suffered from the collective trauma of having survived the atrocities of past Ugandan regimes. These segments of Ugandan society are risk-averse and aren't ready to rock the boat rowed by the man who gave them some feeling of safety even as war raged on in most of northern Uganda up until 2008. Although Bobi Wine has always been political in his lyrics, it wasn't until 2016 that he made his first step into politics. That year, the presidential elections were yet another contest between President Museveni and his longest-running political rival Dr Kizza Besigye. It was that year that Museveni decided it was time to reach out to the young and increasingly desperate generation. 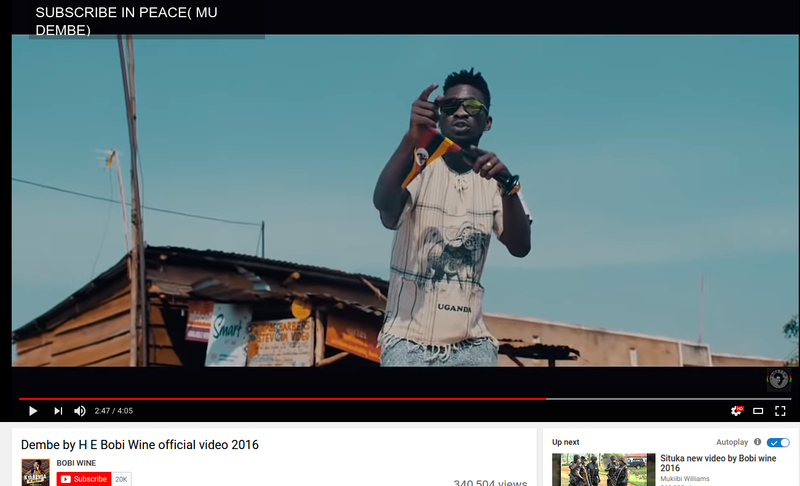 To do that, he paid Uganda's leading artists to compose a song praising his efforts and to campaign for him, a move that infuriated many young people, who retaliated by boycotting their music until some of the musicians apologised. It was then that Bobi Wine's star shone brightly on the Ugandan political scene: he rejected the president's offer to join his campaign and was quite vocal about his decision. As other musicians sang Tubonga Naawe (We are with you) for Museveni, praising his great deeds, Kyagulanyi released Dembe (Peace), attacking the president's greed for power directly and condemning political violence. "Why would you wash white clothes only to hang them on a dirty log to dry?" sang Bobi Wine in reference to what Museveni was doing to the little he had achieved by clinging onto power. "Why don't you look up to Mandela as an example? He ran for one term and released the flag" goes another line of the song. Another track released in 2016, Situka (Rise up), which his supporters sang during protests against his detention, called on young people to rise up and march together against oppression. "When the going gets tough, the tough must get going, especially when leaders become misleaders, and mentors become tormentors, when freedom of expression becomes the target of suppression, opposition becomes our position," goes the opening line of the track. After he was sworn in as an MP, Kyagulanyi did not stop being Bobi Wine. He told reporters that if the parliament won't go to the ghetto, the ghetto will go to the parliament. He then embarked on several concerts across the country, prompting Uganda's highly partisan police to ban some of his scheduled performances in October 2017. "We know you fought a Bush war, but imagine a child who was unborn when you came has long become a parent… They request that you don't touch their constitution because it's their only remaining hope," Bobi Wine sang. Together with the opposition Democratic Party, he led the "Togikwatako" (Do not touch) movement which protested the changing of the last clause in the constitution that stood in the way of 74-year-old Museveni holding onto power for life. In July this year, Bobi Wine was also instrumental in rallying young people to protest a new social media tax which the president presented as being intended to deter "gossip", but which was actually a desperate measure trying to curb escalating anti-Museveni sentiment among the young generation. Why is Bobi Wine a threat to Museveni's power? Bobi Wine's magnetic pull on the electoral scene, which has helped the opposition in key by-elections, has increased paranoia within the ruling party. The realisation that the ground is slowly shifting under their feet has sent those in power into a panic. Young people have responded with contempt to Museveni calling them his "bazzukulu" (grandchildren); their aspirations largely do not include him ruling Uganda past his 77th birthday. Young Ugandans face high unemployment rates and a lack of economic opportunities. What was once touted as Museveni's greatest achievement - security - has been put to a great test the last two years. Crime has increased, with around 43 women targeted, kidnapped, raped and murdered within Kampala and the surrounding areas in the last 18 months. Trying desperately to cover up the fact that his popularity is rapidly declining, the president has blamed the recent electoral setbacks on the Electoral Commission, which he has accused of being "full of rotten people". This is a president grappling with defeat and fearing he could lose the next presidential vote. Nothing about the arrest, torture and charges against Bobi Wine is new. Museveni has handled his main opponents and their supporters in the same way in the past. What is new is the ability of young people to organise, speak up and mobilise on and offline, galvanised by a young voice who is just like them - Bobi Wine. However, it will take a lot more effort on the part of the opposition - beyond Bobi Wine and a growing cult-like following - to bring down Museveni's rule. OkayAfrica spoke to the musician about his time in prison and what it means to be a freedom fighter as he awaits the results of his medical tests and prepares to return to Uganda. The story of Uganda's "Ghetto President," musician and opposition lawmaker Bobi Wine reminds us that the struggle is very much here and now—and that the extreme valor of everyday citizens is what it will likely take to fight it. Since mid-August Wine, born, Robert Kyagulanyi, has been brashly and consistently persecuted by the Ugandan government, stemming from an alleged attack on President Yoweri Museveni's motorcade at a by-election rally in Arua, where they were supporting opposing candidates. The ordeal led to the musician being arrested and rearrested twice, and tortured while in military custody. Since the alleged attack, Wine's driver was shot dead by Ugandan forces and 32 opposition leaders, many of whom still remain in custody, have also been arrested on charges of treason. According to the artist, some have sustained permanent injuries at the hands of officers. Ugandans who took to the streets for anti-government protests clashed with police forces who arrested dozens of people and dispersed tear gas and bullets on numerous occasions. All of this signifying a new phase of Museveni's attacks on the opposition. Wine is currently in the US receiving medical treatment for injuries he sustained while imprisoned. OkayAfrica had the opportunity to speak with the artist over the phone about his current health status, his time in jail, his message for Ugandan youth, and what's next for him as he continues his fight. Read on for our interview with Bobi. Damola Durosomo for OkayAfrica: How are you? I know you were supposed to receive your medical test results yesterday are there any health updates you can share? Bobi Wine: I have actually not yet received my results. I was supposed to get them yesterday, but I was told they were not ready yet. DD: How are you feeling generally? BW: Yes, I am feeling better every day. I am not moving with two crutches anymore, I'm only moving with one. And I hope to start using a walking stick instead. So I'm physically getting better. DD: I'm glad to hear that. I'm also sorry about the loss of your friend Muhammad Kirumira. Do you have any words you'd like to share to honor him? Anything you'd like to say? BW: All I can say is that the tree of liberty is watered by the blood of the patriots. He was a great guy, he was so honest, he was so outspoken. He resigned and exposed the rot and the injustice that was in the police. And I believe he was killed for standing with the masses, for speaking out. DD: When you are sitting in a jail cell and you don't know your fate, what's going on with you mentally? How do you deal with that? BW: Well, it feels bad. My children got holidays, but I was not able to see them, and they are gonna go back to school, I won't be able to see them. It feels bad that I was tortured, its feels bad when I'm in a prison jail. But it gives me so much confidence to be in jail not as a robber, not as a criminal, but as a freedom fighter. I know so many freedom fighters have been through the doors of jail, but again, they walked out free, and I know that truth wins always. I know that oppressed people cannot be oppressed all the time. I am always proud to be persecuted for the truth, and I know that a day will come when history is being written, and I'll be put on the side of those who stood for what is right. DD: I think that part of what the Ugandan government is doing right now is they're putting fear in the minds of people who want to speaking out against injustices. And they're using you as an example. What can you tell young people that want to join in the fight but are afraid of the possible repercussions? BW: Yeah, for the young people particularly in Uganda, I want them to be confident, to know that we are the majority. More than 85 percent of the population is under the age of 35, we are the majority—and we also know, that the people that we are supposed to be afraid of are actually more afraid of us. I know that they do all these things as a sign of fear—they're scared of us. So I continue to call upon the young people to stand firm and to know they cannot kill us all. DD: You've always used music as a social tool against the wrongdoing of the government. Do you plan to return to music anytime soon for the same purpose? BW: I am a musician before anything else and I will always be a musician, because music is my first love and it's my last. I have said it before that I am not a politician, but a leader. Because according to Ugandan standards, the word "politician" has been re-defined as a liar, as a confuser. I am only a musician who is desperate enough to want a country that makes sense for me and for those who are like me. I am one of the 85 percent of young people in Uganda, who are impatient for a country that makes sense. I am one of the majority of the oppressed who wants to take back their country from the oppressor. DD: Upon your arrest, a lot of supporters internationally, fellow musicians, fellow public figures, wrote a letter in support of you. What was your reaction to learning that you had all this support globally? Unfortunately, when I was in consolidation I was held incommunicado. I didn't know what was going on in the outside world—even up to now, so I was not able to appreciate what was going on in the world. I'm still trying to bring myself up to speed to what was happening in the world out there [while I was in prison]. I'm absolutely humbled by the support and love and the words of encouragement and courage that we received from the world over. I am forever indebted to them. My wife was able to be strong because people, comforted her, they stood strong. Friends both in and outside of Uganda stood with us. I am forever humbled by the support. DD: Can you give a quick update possibly if you know of the status of the other 32 people that were arrested alongside you? BW: Many of the people that were arrested alongside me are still in jail. There is a lady who had just had a baby by C-section, she was beaten so badly that even by the time I left Uganda, she was still passing blood in her privates. Another colleague called Shaban Atiku, the doctors told us he will never be able to walk again. I am grateful to the people of Uganda and different NGOs that continue to offer support to my colleagues out there. And when I go back to Uganda next week I am going to join them and we will continue our fight for liberty and dignity. DD: You've earned the nickname of "Ghetto President," in Uganda. What does that title mean to you? BW: Well, it humbles me. First of all, it gives me confidence that the people who brought me up still own me, I am a ghetto child. I am a ghetto youth. I come from the ghetto. I get so much pride from seeing that the people of the ghetto still claim me as their own. For them to call me their president still humbles me, it shows me that they believe in my kind of leadership and they believed that what I'm doing is giving them dignity and they're proud of me. DD: Is running for president of Uganda something you'd be open to in the future? Clearly there's an aching for your type of leadership in the country. BW: Well, I'm glad you said that it's "something for the future," but before the future comes we have a present to sort out, where we don't want to be nobody's slaves. We know that as the people of Uganda we have no right to even talk about the presidency before we talk about the freedom and the right to be heard out. DD: The situation facing Uganda isn't just a Ugandan problem. It happens across the continent with oppressive regimes that are in charge. How do you think the struggle you're facing can reverberate across the continent and can help people rally and challenge their own governments? BW: I personally don't belong to any political party, but I think that now what we're facing in most countries in Africa, is the "big man syndrome." One leader gets a few colonies and operates the majority. It is not only happening in Uganda alone, and that's why we call ourselves "people power." The struggle we are facing is not limited to Uganda alone, but it's a struggle against oppression across Africa and indeed across the world. So, just like we got support from across Africa and across the world, we call upon Africans, especially young Africans to know that there will never be another time for them to assert their rights other than now. More Ugandans say they prefer democracy over any other system, but fewer are satisfied with the way their democracy is actually working, a new Afrobarometer survey shows. Popular preference for democracy has been remarkably cyclical, rising before and falling after presidential elections. But satisfaction has been on a 17-year slide. Data show that this satisfaction gap (between the proportion of citizens who prefer democracy and those who are satisfied) is strongly and negatively related with the perceived quality of elections as well as public views on how well the government has performed on economic and political indicators. These findings suggest a dampening effect on popular support for democracy and perhaps vindicate the public call for better service delivery and for reforms to improve the quality of Uganda’s elections. Since the year 2000, the proportion of Ugandans who prefer democracy over any other system has been increasing but non-uniformly, with each increase before a general election being followed by a decrease after the election (Figure 1). During the period 2000-2017, popular satisfaction with the way democracy works in Uganda steadily declined, from 62% to 46%. Ugandans are consistently more likely to prefer democracy than they are to be satisfied with the way their democracy is actually working. The 5-percentage-point gap recorded in 2000 grew to 15 points after the 2001 elections; the 10-point difference in 2005 grew to 25 points after the 2006 elections; and the 14-point gap in 2015 grew to 34 points after the 2016 elections (Figure 2). Corresponding to this satisfaction gap, we see a drop in support for democratic values such as support for the rule of law, freedom of the press, parliamentary oversight, multipartysm, and freedom of assembly and association (Figure 3). Afrobarometer is a pan-African, non-partisan research network that conducts public attitude surveys on democracy, governance, economic conditions, and related issues in Africa. Six rounds of surveys were conducted in up to 37 Africans countries between 1999 and 2016, and Round 7 surveys (2016/2018) are currently underway. Afrobarometer conducts face-to-face interviews in the language of the respondent’s choice with nationally representative samples. The Afrobarometer team in Uganda, led by Hatchile Consult, interviewed 1,200 adult Ugandans between 26 December 2016 and 8 January 2017. A sample of this size yields country-level results with a margin of error of +/-3% at a 95% confidence level. Previous surveys were conducted in Uganda in 2000, 2002, 2005, 2008, 2012, and 2015. 1. Which of these three statements is closest to your own opinion? Statement 1: Democracy is preferable to any other kind of government. Statement 2: In some circumstances, a non-democratic government can be preferable. Statement 3: For someone like me, it doesn’t matter what kind of government we have. 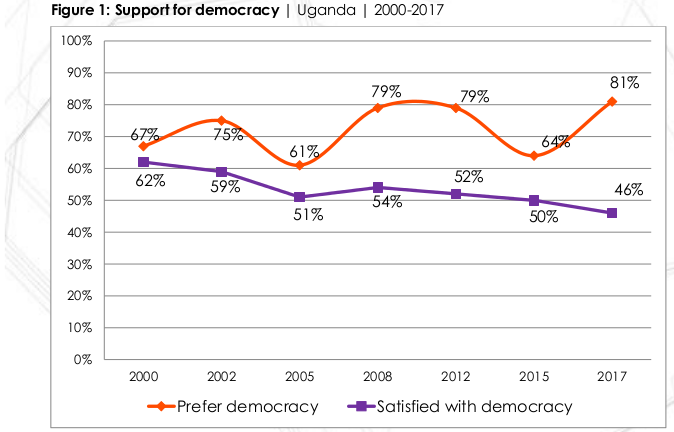 Graph shows the growing gap, in percentage points, between the proportion of Ugandans who prefer democracy and the proportion who are fairly/very satisfied with the way democracy is working (from Figure 1). Uganda’s last four election years are plotted to illustrate the fluctuating nature of the growing gap with the election year. Nearly half (48%) of Ugandans fear “somewhat” or “a lot” becoming victims of political intimidation or violence during election campaigns. About one in seven Ugandans (14%) say they experienced violence at political events during the past two years, while an additional 33% say they feared but did not experience violence at political events. Women, urban residents, and better-educated citizens are more likely to express fear of political intimidation or violence during election campaigns than their male, rural, or less-educated counterparts. Six in 10 Ugandans (64%) say citizens “often” or “always” have to be careful about what they say about politics. A similar proportion (63%) say Ugandans have to be careful about how they vote. And a majority (53%) say they often/always have to be careful about which political organisations they join.